Bosnia and Herzegovina - Human Rights Watch. Bosnia and Herzegovina - International Crisis Group. Burma - Human Rights Watch. Burma Projec: Southeast Asia Initiative - Established by the Open Society Foundations in 1994 to increase international awareness of conditions in Burma and help the country make the transition from a closed to an open society. Cambodian Genocide Program - The Cambodian genocide of 1975-1979, in which approximately 1.7 million people lost their lives (21% of the country's population), was one of the worst human tragedies of the last century. As in Nazi Germany, and more recently in East Timor, Guatemala, Yugoslavia, and Rwanda, the Khmer Rouge regime headed by Pol Pot combined extremist ideology with ethnic animosity and a diabolical disregard for human life to produce repression, misery, and murder on a massive scale. Cambodian Genocide Databases (CGDB) - Developed by a team of academics, technicians and documentalists at Yale University, the Documentation Center of Cambodia (DC-Cam), and the University of New South Wales (UNSW) in Sydney, Australia. The CGDB contains information pertaining to massive violations of human rights in Cambodia during the Khmer Rouge regime of 1975 to 1979. East Timor - World-Wide Web Virtual Library service. East Timor Action Network - U.S. Enough Project - Fights to end genocide and crimes against humanity, focused on areas where some of the world's worst atrocities occur. Get the facts on the ground, finds sustainable solutions, influences political leaders to adopt its proposals, mobilizes the American public to demand change. Ethnopolitical Warfare: Causes, Consequences, and Possible Solutions - Edited by Daniel Chirot, PhD and Martin E. P. Seligman, PhD. Frontline: The Crime of Genocide (PBS) - Genocide is distinguishable from all other crimes by the motivation behind it. Towards the end of the Second World War, when the full horror of the extermination and concentration camps became public knowledge, Winston Churchill stated that the world was being brought face to face with 'a crime that has no name.' History was of little use in finding a recognised word to fit the nature of the crime that Nazi Germany, a modern, industrialised state, had engaged in. There simply were no precedents in regard to either the nature or the degree of the crime. Raphael Lemkin, the Polish-born adviser to the United Staes War Ministry, saw that the world was being confronted with a totally unprecedented phenomena and that 'new conceptions require new terminology.' In his book, Axis Rule in Occupied Europe, published in 1944, he coined the word 'genocide', constructed, in contradiction to the accepted rules of etymology, from the Greek 'genos' (race or tribe) and the Latin suffix 'cide' (to kill). According to Lemkin, genocide signifies 'the destruction of a nation or of an ethnic group' and implies the existence of a coordinated plan, aimed at total extermination, to be put into effect against individuals chosen as victims purely, simply and exclusively because they are members of the target group. 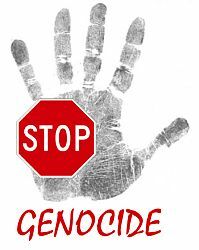 GenoCost - An initiative from the Congolese Action Youth Platform (CAYP) for the recognition of the genocide against the people of Democratic Republic of the Congo. Human Security Report Project (HSRP) - Tracks global and regional trends in organized violence, their causes and consequences. Research findings and analyses are published in the Human Security Report, Human Security Brief series, and the miniAtlas of Human Security. HSRP publications have received major coverage in the international media and are regularly cited by national governments, international agencies, and NGOs, as well as the research community. Montreal Institute for Genocide and Human Rights Studies - Collects and disseminates knowledge created by researchers about the historical origins of the mass killings that have become such a prominent part of the twentieth century. The Institute accomplishes its mission through research, teaching, workshops, conferences, and publications. Prevent Genocide International - A global education and action network established in 1998 with the purpose of bringing about the elimination of the crime of genocide. Web Genocide Documentation Centre - Resources on genocide, war crimes, and mass killing. Catholics and the Holocaust - Hiatt Holocaust Collection. March of the Living - An international, educational program that brings Jewish teens from all over the world to Poland on Yom Hashoah, Holocaust Memorial Day, to march from Auschwitz to Birkenau, the largest concentration camp complex built during World War II, and then to Israel to observe Yom HaZikaron, Israel Memorial Day, and Yom Ha'Atzmaut, Israel Independence Day. Simon Wiesenthal Center - A global Jewish human rights organization that confronts anti-Semitism, hate and terrorism, promotes human rights and dignity, stands with Israel, defends the safety of Jews worldwide. Survivors of the Shoah - The USC Shoah Foundation Institute is a non-profit dedicated to overcoming prejudice, intolerance, and bigotry--and the suffering they cause--through the educational use of the Institute's visual history testimonies. Teacher's Guide to the Holocaust - Also see Bibliographies. Rwanda - Query for article on Rwanda found in the Journal of Humanitarian Assistance. Crisis in Darfur - The United States Holocaust Memorial Museum has joined with Google in an unprecedented online mapping initiative. Crisis in Darfur enables more than 200 million Google Earth users worldwide to visualize and better understand the genocide currently unfolding in Darfur, Sudan. The Museum has assembled content-photographs, data, and eyewitness testimony-from a number of sources that are brought together for the first time in Google Earth. This webpage last updated on Thursday, August 17, 2017 8:19 PM.